​​​ SAN ANTONIO – Gelt Inc. has purchased a two-property, 588-unit apartment portfolio near the medical center. The two adjacent properties include Barcelo, a 280-unit community at 3501 Pin Oak Dr., and Melia, a 300-unit community at 3431 Oakdale St.
Barcelo, built in 1972, is 94 percent occupied. Melia, built in 1976, is 95 percent occupied. They feature one-, two- and three-bedroom floorplans with units averaging 938 sf. Over the past five years, the two communities have been upgraded with new clubhouses and fitness centers. Gelt plans to invest further in each property. 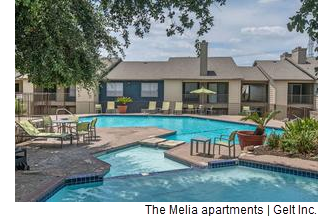 ​Check o​ut San Antonio-New Braunfels Multifamily Market Research​.